Each halogen combines with another halogen to form several compounds known as interhalogen compounds. The less electronegative element is written first. In naming also, the less electronegative element is mentioned first. They are divided into four types. Each halogen combines with another halogen to form several compounds known as interhalogen compounds. The less electronegative element is written first. In naming also, the less electronegative element is mentioned first. The bonds are essentially covalent because of the small electronegativity difference, and the melting and boiling points increase as the difference in electronegativity increases. The interhalogens are generally more reactive than the halogens (except F) because the A-X bond is weaker than the X-X bond in the halogens. The reactions are similar to those of the halogens. Hydrolysis gives halide and oxyhalide ions, the oxyhalide ion being formed from the larger halogen present. 2. Type AX3 Compounds of the type AX3 have trigonal bipyramidal structure, Fig. 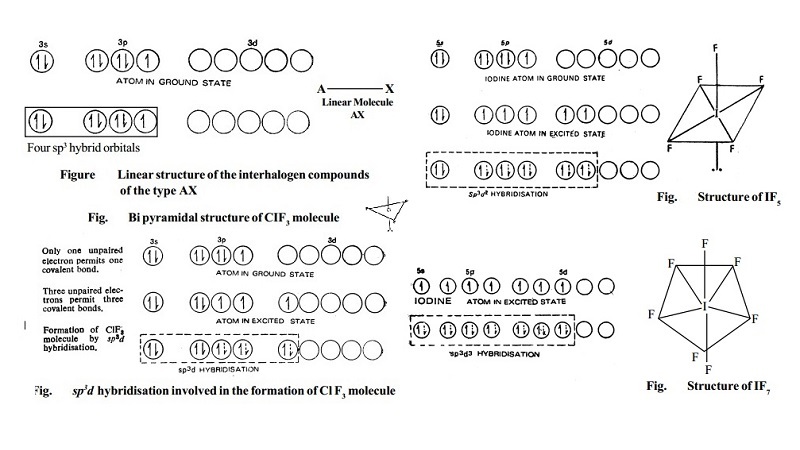 for the ClF3 molecule. 4. Type AX7 (IF7). This compound has a pentagonalbipyramidal structure since this is formed by sp3d3hybridisation. An element A occupies group number 17 and period number 2, shows anomalous behaviour. A reacts with water forms a mixture of B, C and acid D. B and C are allotropes. A also reacts with hydrogen violently even in dark togive an acid D. Identify A,B,C and D. write the reactions. i) The element A that occupies group number 17 and period number 2 is fluorine.